Note that satnav gets confused right at the end of your journey and doesn’t recognize that Chapel Lane joins the Burley Road at the Carpenters Arms pub. It thinks that this is Hill Lane. So follow the instructions below for a trouble free journey! Continue onto the A31 dual carriageway and travel about eight miles across the forest. Then you will see an exit left, signed Burley. Travel about two miles into the centre of Burley, with several shops. 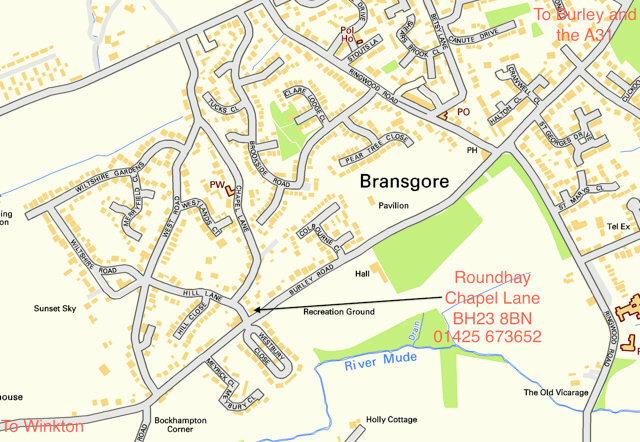 Turn right towards Bransgore. After another two miles you will start a long gentle downhill and pass the Crown Inn at a crossroads. Another three hundred yards and you will pass the recreation ground on your left. Then you will see the Carpenters Arms pub coming up on your right. Best is to park in the pub car park (they are fine about this despite the sign about clamping) and walk round in front of the pub into Chapel Lane. Roundhay is the first drive on the right, with a wooden gate. Knock on the green front door with panes of glass to either side..
Leave the Wessex Way for Bournemouth Airport. At the small roundabout at Hurn, which has just two exits, turn right and go about two miles over the watermeadows and then cross the River Avon. Turn right and after half a mile you will go through Sopley. Ignore the sign left to Bransgore. Go another half a mile and in Winkton, on the crown of a right hand bend, turn left to Bransgore. Travel about two miles and you will see the Carpenters Arms pub coming up on your left. Best is to park in the pub car park (they are fine about this despite the sign about clamping) and walk round in front of the pub into Chapel Lane. Roundhay is the first drive on the right, with a wooden gate. Knock on the green front door with panes of glass to either side.